Carly has dropped out of uni to spend her days surfing and her nights working as a cook in a Manly café. Surfing is the one thing she loves doing … and the only thing that helps her stop thinking about what happened two years ago at schoolies week. And then Carly meets Ryan, a local at the break, fresh out of jail. When Ryan learns the truth, Carly has to decide. Will she let the past bury her? Or can she let go of her anger and shame, and find the courage to be happy? 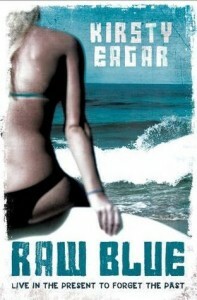 I’ve heard of Raw Blue several times from friends who raved about it, and said it was exceptionally good Aussie fiction. Of course, as with most of these good Aussie fiction, it was kind of hard to acquire a copy, so I was really, really glad when this was picked up by a UK publisher so it was available via Book Depository. I picked up Raw Blue because I was headed for a trip to the beach with my colleagues, where there were chances to surf (which we didn’t really do). Plus I have been craving for some good contemporary YA book from all the serious, adult books I’ve been reading back then. Carly quit university to spend her days surfing in the morning and working as a cook in a cafe in the evening. She keeps to herself, and to her surfing, because it was the only thing that could help her forget about what happened two years ago in school. Then Carly meets Ryan, who seems to be attracted to her. She finds herself drawn to him, but her past is stopping her. Can she let go of all the pain from what happened to her and move forward, if it means being truly happy? Carly was kind of hard to get into because she’s so…rough. So angry. So alone. For all the good reasons, too, because of what happened to her. But that’s it, she’s so rough. And in pain. I think in the course of Raw Blue , I felt more sympathy for the people around her who tried to reach out to her – Danny, Hannah and Ryan. They seem like truly good people, and the ones that you would want to have when you’re stuck in darkness and would bring you out only if you let them. I thought Danny was especially endearing, with his synesthesia and how he just assumed he was friends with Carly from the start. Ryan was just as rough around the edges, and it took me a while to figure out if I liked him or not. I thought Janice‘s description about hm and his relationship with Carly was described perfectly: “…and then there’s Ryan, who looks at Carly and thinks she’s a good thing.” I think that’s what we need sometimes — someone who looks at us and sees us as something good, even if we cannot see it for ourselves.